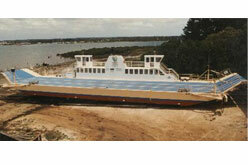 Over the years Crib Point Engineering have made many boats, barges, floating plant. These have ranged from High speed supply boats, Yachts, Tug boats to 55 meter heavy oil bunker barges and vehicle Ferries. 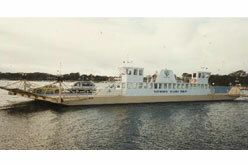 The Raymond island ferry in the Gipsland lakes (Victoria). This ferry uses twin chain drives to propel the ferry across its straight. This ferry was fabricated, powered, painted and fitted out in our Hastings workshop and then towed to its place of operation.